Update August 14, 1:05 PM: As noted below, prior to the shootout with police, the first victim was take to Advocate Christ Hospital. That man “has been released from the hospital after being treated for multiple gunshot wounds,” according to Park Forest Police Chief Christopher Mannino. 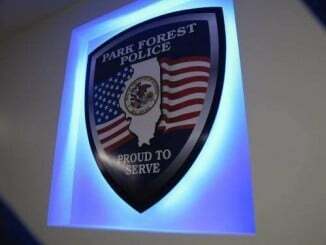 Park Forest, IL-(ENEWSPF)- A shooting suspect was killed after a shootout with police in an incident that began in Park Forest with an alleged armed robbery, police said. Appearing ashen and worn, Police Chief Christopher Mannino updated the Village Board and the public on a shooting incident Monday afternoon that resulted in one man shot by another, sent to a hospital, and the shooting suspect dead after a shootout with police. 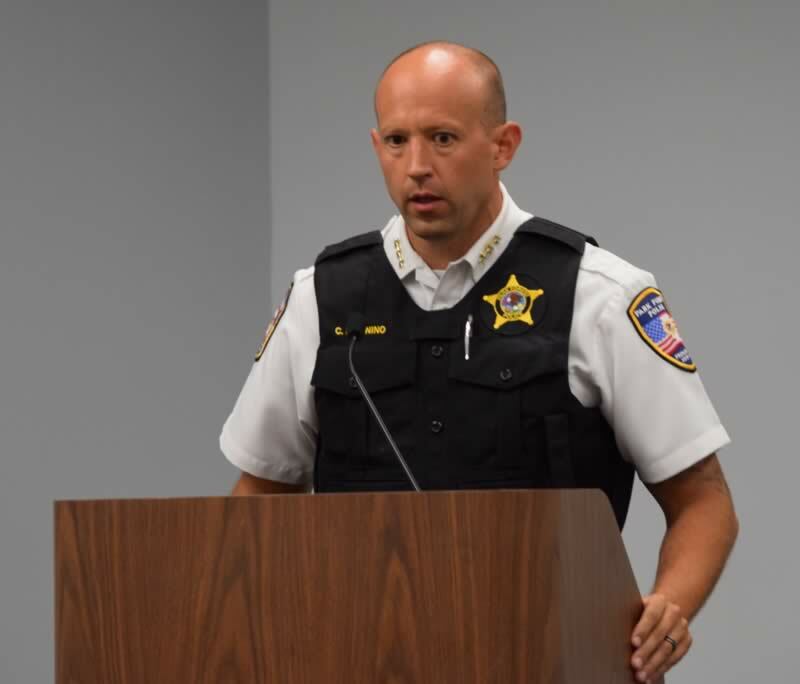 Chief Mannino, speaking without notes, provided an update to the board and the public that was almost identical in content to an earlier release from the Park Forest Police Department. “Today at about 2:00 p.m., Park Forest Police were dispatched to the 400 block of Suwanee Street in reference to a report of a man shot in the head,” Chief Mannino said. “Officers responded and found that a man had been shot in the head, however he was able to communicate at that time. “Officers obtained a description of the suspect. An officer in the area saw a man matching the description of the suspect walking into Richton Park, just a few blocks away. He made contact with the man and gave him orders. However, the man refused to comply. “That officer called for backup. Additional officers responded, and the man again refused police commands as he continued to walk away. “At some point in that interaction [the suspect] produced a firearm. There was a subsequent exchange of gunfire between him and the officers on the scene. “[The suspect] fled westbound and that exchange of gunfire continued for approximately one block. As he fled westbound, he continued to display his gun and point it at officers. “The incident concluded with [the suspect] collapsing after having been shot. Officers immediately began performing CPR, and so did the paramedics. However, he was later pronounced dead. 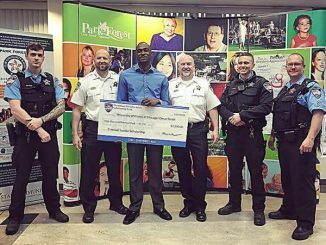 “No officers were physically injured during this incident, and a total of three Park Forest Police Officers and one Richton Park Police Officer was directly involved in this incident. “Per our policy, the officers involved in the shooting will be investigated by the Illinois State Police Public Integrity Unit. Involved officers will be on administrative leave while we initiate this investigation. “The man who was originally shot was transported to Christ Hospital with life-threatening injuries. I do not have an update on his condition at this point in time,” Chief Mannino concluded. Chief Mannino left the board meeting shortly after he delivered his report to return to the station. Another officer arrived and remained past the end of the meeting as board members and members of the public left the building. Police Chief Christopher Mannino’s update to the public on Monday’s shooting incident. On Monday, August 13, 2018 at approximately 2:00 p.m., Park Forest Police were dispatched to the 400 block of Suwanee Street for the report of a man shot in the head. Responding officers found the man with a serious wound but able speak. After a suspect description was obtained, a responding police officer located a man matching the suspect description walking a short distance away into neighboring Richton Park. When the suspect refused police orders to stop and continued to walk away, additional officers responded. The officers reported that the suspect, while continuing to disobey police commands, produced a handgun and an exchange of gunfire ensued as the man ran westbound. The exchange of gunfire occurred over an approximately block-long distance, at the conclusion of which the suspect collapsed. The responding officers then began performing CPR on the man and summoned paramedics, but he was later pronounced dead. His identity is being withheld pending notification of next of kin. The suspect’s firearm was recovered at the scene. No officers were struck in the exchange of gunfire. The original victim was transported to Christ Hospital with life-threatening injuries. A total of three Park Forest Police Officers and one Richton Park Police Officer were directly involved in the exchange of gunfire. Per department policy, they will be placed on administrative leave while an investigation is initiated. The officer involved shooting is being investigated by the Illinois State Police Public Integrity Unit. Additional information will be released as it becomes available. How Do I Avoid A Carjacking?